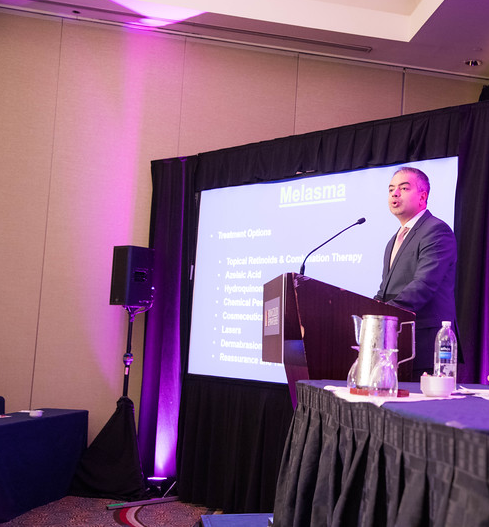 During his talk at the 2018 Skin of Color Seminar Series (now known as the Skin of Color Update), Dr. Seemal Desai discussed the treatment of melasma with a particular emphasis on new and emerging therapies. Dr. Bridget Kaufman, onsite correspondent for the meeting, shares highlights directly from the talk. *Clinical pearls* from this session are bolded, underlined, and marked with asterisks. Dr. Desai started by stressing the importance of having an honest and upfront conversation with your melasma patients about realistic expectations for treatment. *You must emphasize to patients that this is a chronic condition and set their expectations accordingly. *While improvement with treatment is likely, there will always be underlying pigmentary changes even despite treatment. Patients must understand from the beginning that they cannot be cured of this condition. Excerpt provided with permission. Originally published by Next Steps in Dermatology. All rights reserved.